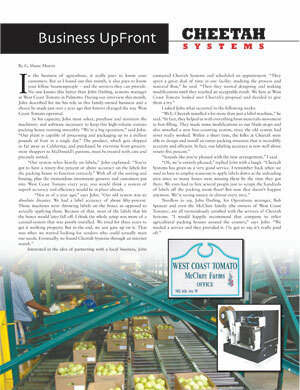 Developed in a cooperative endeavor with one the largest produce suppliers in the United States (View June 2008 Feature article from "In The Field Magazine). 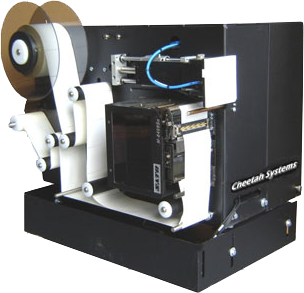 The Cheetah Systems Model 313-LPA-T (shown above) is a heavy duty Bar Code Labeling System. "Literally it will last you a lifetime." Our Labeling Systems feature a Sato Print engine and can also be outfitted with a DataMax or Zebra print engine. Each Print and Apply Labeling System has an on-board PLC which can be programmed to control, manage and enhance your conveying machinery within the labeling area to improve your product throughput. It can also keep track of more than one filler on a single line! 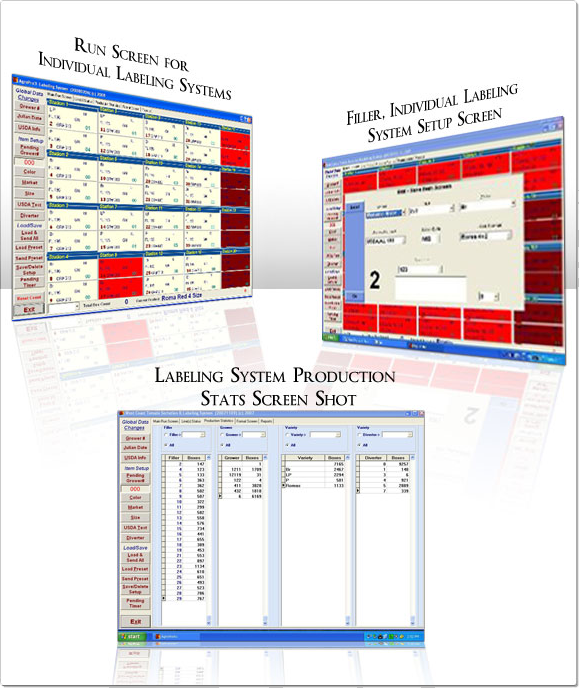 View Labeling System Production Line layouts. When operated with our own AgroPro3 Plant-Floor Labeling System Control Software, the Labeling System becomes a powerful tool for product identification and accurate production reporting. 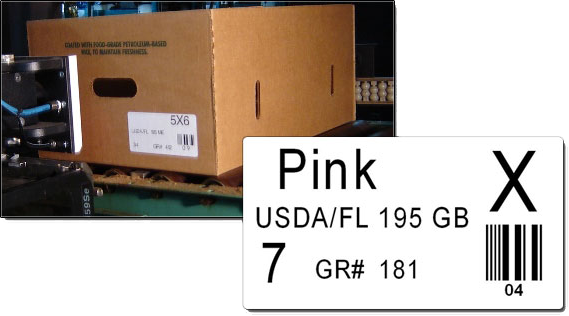 The label example shown (right) will provide your personnel with an easily readable consistent identifier on every case for product tracking, storage and shipment. In this example the actual label size is 4 inches wide by 2 inches tall. 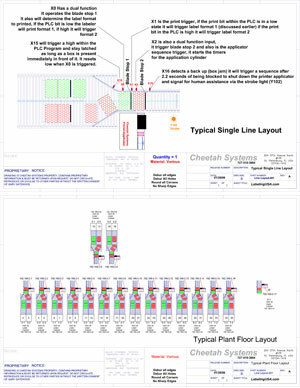 The Cheetah Systems Model 313 LPA-T Labeling System can handle a multitude of label sizes and configurations. Does your company have a special application? Give us a call to discuss your labeling & identification needs today. AgroPro3 is a Windows based application developed & distributed by Cheetah Systems to interface from a single production office PC to a production floor consisting of 1 to 20 individual Labeling Systems. When coupled with the on-board PLC intelligence of the individual Labeling System it can maintain, control and accurately keep track of up to 40 fillers. 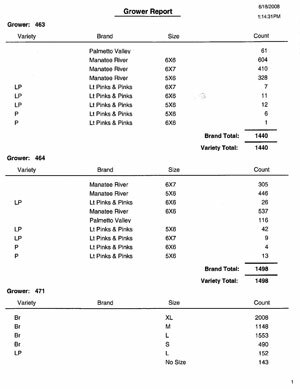 Click Here to view Labeling System Line Layouts. The system is fully configurable for your production requirements. Each Labeling System can be controlled real-time individually or changes can be made globally without product flow interruption when line changes, grower changes, lot changes or other production changes require it, using our standard Ethernet interface. The main benefit of the Cheetah Systems AgroPro3 configuration is that each Labeling System is a local system. When controlling and tracking two fillers, the information is sent to the Labeling System via AgroPro3 and is stored in memory until the on-board PLC determines from which filler the case originated, and it will then print and apply the proper label for that product. This greatly increases the speed, efficiency and accuracy of your production runs and increases overall product throughput. Does your company have a custom application? Call us today at 727-217-6719 or email us at sales@cheetahsystemsllc.com for your solution! "Our Case Labeling Systems are fully configurable to meet your needs."